Christmas. A time for some of the worst television of the year – endless nostalgia programmes, repeats of Christmas specials and a whole channel dedicated to watching Jamie Oliver cook Christmas dinner for his family. A time when the potential to broadcast to a large viewing audience is at it’s peak, and yet for some reason commissioners decide that what everyone really wants to see is what was on last Christmas, and the Christmas before that, oh and then let’s just listen to the Queen answer the world’s problems with a Christmas tree anecdote and a quote from the bible. And so, like last year, we sit through our yearly dose of Christmas specials and a particularly ridiculous episode of Eastenders. While there probably wasn’t anything in the natural history genre this year to rival the Queen’s speech or Eastenders for viewing figures, if you did manage to sort through the usual festive rubbish there was actually some good wildlife TV to choose from. The most obvious attempt from the genre to bring in a large Christmas audience was Snow Chick, the latest from John Downer Productions in filming a species’ most intimate moments. The camera work was fantastic as can be expected from JDP, and there were some touching scenes like the one where a chick finds its way into a huddle for the first time and is embraced by the huddle of other chicks rotating to keep warm. The show had a good balance of humour and “aw” factor, and while it was a bit mushy for me (made worse by Kate Winslet’s narration), it was entertaining and well suited to a BBC One Christmas audience. The rest of the natural history output throughout the festive period however, seemed to be dominated by something new for Christmas television: conservation. I had heard some big words about more conservation on the BBC from commissioning editor Lucinda Axelsson at Jackson Hole in October, but while I was pleased to hear the BBC talking the talk I didn’t expect to see them walking the walk so soon. The conservation/climate change episode at the end of The Hunt was much more than the usually quite weak message buried under stunning BBC blue chip images; this time an entire epsiode was focused on discussing the issues and showing the people working to conserve our natural world. 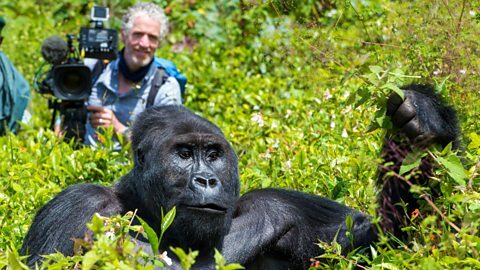 And that was just the beginning – the successful Gordon Buchanan “Family & Me” format continued this year with Gorilla Family & Me, and the second of this 2-part series was about the different ways that the rangers and other staff at the Kahuzi-Biega National Park are conserving Grauer’s gorillas and their forest home. Gorilla Family for me was a landmark for the BBC in it’s balance between an emotional story, investigative science, and a proper discussion on conservation. The viewer is introduced to the gorillas through Buchanan in the first episode, and by the end of the hour is drawn into the incredible experience it must have been to meet Chimanuka and his family. Thermal imaging cameras bring the scientific element – we haven’t seen gorillas at night before – and then by the second episode the audience is primed for a discussion on the conservation of these magnificent beasts. Buchanan talks to the rangers about the dangerous work they do fighting poachers, and we hear about their hope for ecotourism in the future – something Buchanan even gets involved in directly as he helps them to habituate a new gorilla family to a white face. The engaging plot and structure of the series are clever but also work to prove that there are stories in conservation that translate well onto the screen; hopefully this will be something that we now see more of. Continuing on the subject of gorillas was ITV’s John Bishop’s Gorilla Adventure, where the comedian went to meet the Gorilla Doctors in Rwanda who provide veterinary help to wild gorillas. Interesting that even ITV is showing a conservation story, and the programme managed to not only highlight the plight of mountain gorillas but also discuss the region’s change from being one of volatility to one of peace and stability, with a strong sense of community. Quite heavy stuff for ITV, but an important story and again hopefully a sign of more like this to come for broadcast television. It may be that it’s the 30th anniversary of the death of gorilla conservationist Dian Fossey that we’re suddenly seeing gorillas on TV this Christmas, or it could even be just that gorillas are on trend this year after Virunga. But hopefully, for whatever reason, conservation on TV is here to stay. I imagine Dian Fossey would have particularly enjoyed the new TV trend this Christmas. Let’s hope it’s one that continues into the new year. This entry was posted in Blog and tagged BBC, BBC NHU, Christmas, conservation, Dian Fossey, filmmaking, Gordon Buchanan, Gorilla Family & Me, gorillas, Grauer's gorilla, ITV, John Bishop, John Bishop's Gorilla Adventure, John Downer Productions, nature, Snow Chick, television trends, Wildlife.